We were talking about how they hire people, and he was explaining his hiring process. Now, I combined that with a number of the ways we do things and some of the considerations of others such as the Base Camp people and many others who have been doing this for many years. Because a lot of us in, say, traditional businesses, don’t really think outside the box and haven’t caught on to what is possible in the modern world in the 21st century. We think we have to have people who live within a drive who come to premises, who are local who we have to see every day. And it’s not like that. 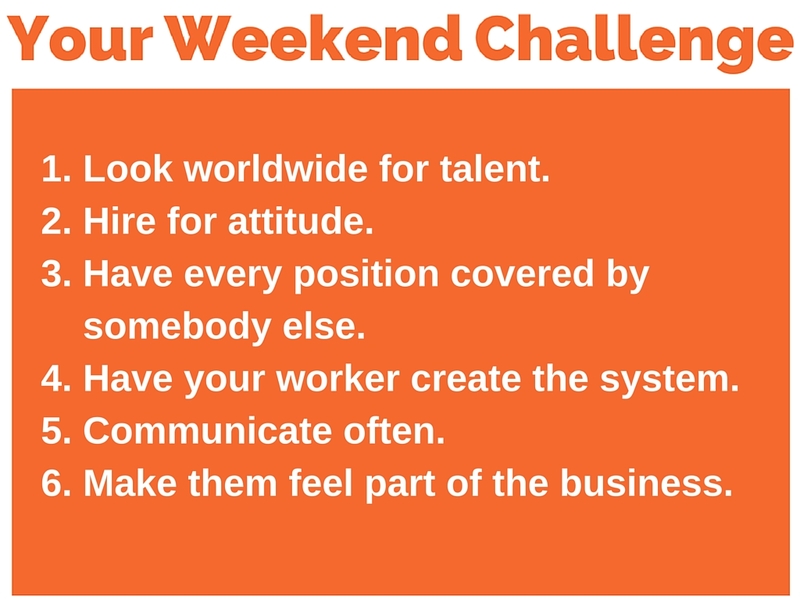 So this is a weekend challenge, as you know Fridays are the weekend challenge, you can see them all at marketingforowners.com/challenge, there’s rather a lot so you can go through them. So this is just going to give you some ideas and thoughts the next time you hire or when you say, “But I can’t find anyone to do social media, etc. because I live in the middle of nowhere, in the country, I live on a farm”, stuff like that. #1 Look for World Wide Talent: Do not restrict yourself. his is the World Wide Web and people communicate via e-mail, via Skype, via messaging systems, via text, via anything, via Facebook, via groups, via forums. You do not need the person to be sitting in an office watching you, there are ways that it can be done. By expanding your reach, this increases your chances of finding a better quality person, a more qualified person. And this is the great thing, it saves a fortune. For example, I’m in the UK. Many of you may be in the USA or South Africa or Canada or Australia, how about the Philippines? Now in the Philippines the language of business is American English, but that’s okay. So this is in the UK, many of us are not aware that Filipinos mostly speak English. There’s call centers galore out there and of course for the UK also, there is India, there’s a school of talent there, massive and these people earn a fraction of what it costs to employ someone in our country because of the lower cost of living. It’s not that we are cheating them, no, we pay the going rate, it’s just that it’s lower. And of course when those people work from home, they don’t need to travel and all that kind of good stuff and you don’t need to provide them with a desk and a computer and holiday extras and things like that. There’s all sorts of ways of doing it. And of course you can have them as paid staff, you can have them as just outsourced project by project, you can do it all kinds of ways. #2 Hire for Attitude: Do not worry too much about talent. Hire for attitude, or say higher for character, those are the two words that I would implore that you use when you interview people, even locally. Skills can be taught. Now whatever you’ve learned over all these years, you learned, you didn’t know it at the start, you may be fantastic at it now, but other people can learn as well, you’re not the only clever one on the planet, so find someone with an attitude and character, that’s what you’re after. So when you talk to them and ask them questions, develop your questions from that end and you will find that what they are really like then they’re going to be of benefit to you. 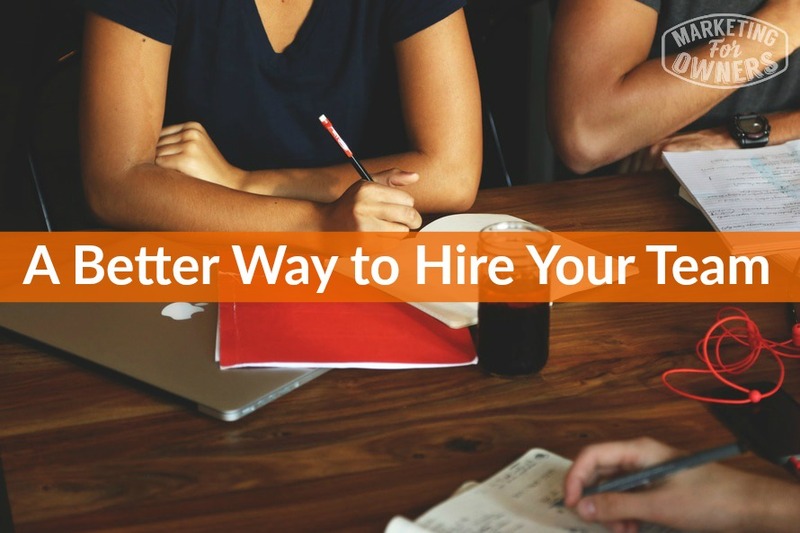 #3 Have Every Position Covered by Someone Else: Now of course that doesn’t mean that for everyone you have to hire two people, but say for instance, in your marketing team, you may have somebody who writes blog posts, a writer. You may have someone who does your social media. Why can’t those two people cover each other? So at some point or other when one is sick or is away on vacation or holiday, then another person is capable of doing the same job and also just as likely if one person leaves out of the blue, you have somebody else ready. So when you hire again that other person can train the new person and you don’t have to spend your time doing all that. Pretty cool, eh? Now the way James does it, he has little parts of three, so two people and the team leader, but he’s got a much larger team, so this depends on the size. But try and have more than one person know how to do every job, we do this by the way at Fire Protection Online and it saves us a fortune and a lot of headaches. 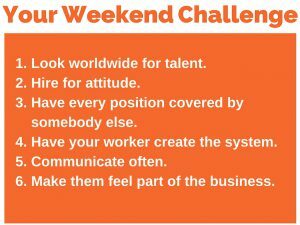 #4 Have Your Worker Create the System: First of all, have systems. Now that may sound boring, but who wants to do that? But I can explain a couple of ways to do it. For instance you are teaching how to do a post on Facebook. Simply screencast yourself, record your screen and what that means is you use a free software like ScreenCast-O-Matic or CamStudio or Jing. These are all free, they’re downloads, they will record your screen and what you’re saying and what you’re doing. All you have to do is record it and say, “That’s how you do it”, then you’ve got a video , instant. You only have to do it once. You can do this with everything. Easy, eh? Now when they are creating systems, so when you’re teaching them, they’re creating systems, you show them once and then they as they do it can write to system. They can use a tool such as Process Street or Sweet Process or another program you are comfortable with. Or just simply use Word, Excel, whatever, just simply get them to do it. But most important, once they’ve done it, check that they are writing systems in the correct way. Take the system, give it to somebody else who doesn’t know how to do the job and ask them if they can follow it through and it gives you proof if it’s working. They do it every time the next time you employ someone to do the same job, you’ve got a full manual of how it’s done. #5 Communicate Often: For example you are in America and the person is in the Philippines, communicate with them all of the time, do not ignore them. Never, ever assume that the person knows exactly what to do; it’s probably better to assume they don’t until they’ve been there awhile. Any excuse to communicate is good, it makes them feel part of your team, it doesn’t make them feel abandoned or isolated. And you can do that via Skype or you can do it via e-mail, but I would suggest that you check out a service called slack.com. It’s massive, it’s free and it is a way a massive amount of organizations communicate these days. #6 Make Them Feel a Part of the Business: Do not allow somebody, and this applies to all your staff, all your team, do not allow them to just feel like they are an employee, make them feel part of it, that means involving them in your plans. Have regular meetings to tell them your plans and then ask them for their ideas and input. Remember, you might think you are a tyrant. But that’s not going to help. These people are intelligent people, they are the same as you, it’s quite feasible that they are more intelligent than you and have got better ideas. How are you ever going to find out unless you ask? And that’s it. Doesn’t that sound like a better way to hire a team? I think it does. So just try that, it’s easy, it gives you some ideas you can apply it locally, you can apply it worldwide, but just think about it the next time you hire. Now I know it’s going to be a fabulous weekend and I’m going to be celebrating 300 episodes in the podcast. And I’ll be back on Monday with episode 301, looking forward to the next hundred. You have yourself a wonderful weekend, enjoy your family or enjoy your own company. I’ll see you soon. Want more Weekend Challenges like this one? Be sure to visit our growing list located here.